May 3, 2017, 11:35 a.m.
By Joseph Lichterman @ylichterman May 3, 2017, 11:35 a.m.
Last year, the giant Scandinavian publisher Schibsted restructured its product team. It centralized its efforts, creating one unified product and technology group that worked across all its publications. The idea was that the product team would be able to work with individual publications to develop new products before scaling them out to the rest of the company. 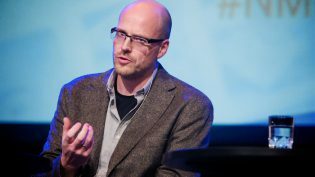 Schibsted — which publishes newspapers such as Verdens Gang and Aftenposten in Norway and Aftonbladet in Sweden, along with a strong digital classifieds business — also created a Next Generation Publishing Products team to help develop new ways to tell stories and present news to readers. Sundve spoke last week at WAN-IFRA’s Digital Media Europe conference in Copenhagen, Denmark, and he and I met after his talk to discuss Schibsted’s strategy in more detail. He described how the team is working with Verdens Gang to develop a messaging-based news product and also working with Aftenposten to create automated personalizable homepages. The ultimate goal, Sundve said, is to enable all of Schibsted’s publications to use the platforms. “If they nail it, all the other companies will be on that other platform,” he said. What follows is a lightly edited and condensed transcript of our conversation. Joseph Lichterman: You talked to my colleague Shan last fall about the transition to the more centralized product strategy. Now that it’s been six or seven months, how do you think things have been going? Espen Sundve: By and large, I think it’s going well. We haven’t changed our goals, we haven’t changed our plan. By and large, we’re on schedule and pushing forward. Lichterman: The product folks are still in the individual newsrooms? Sundve: There’s a combination. We’ll still have a range of teams with product managers, UX leads, and tech leads embedded with the brands, but they now belong to a global unit. There’s solid-line reporting out of the publisher. At the moment, in terms of the number of people, it’s like 50/50 in terms of embedded versus other aspects. Lichterman: Is it a challenge to balance the needs of the centralized team with the individual titles? Lichterman: It sounds as if, right now, you’re mostly internally focused in terms of the things that you’re working on. Sundve: Absolutely. There’s a big change there, and then of course really balancing short-term needs versus long-term perspective. In most cases, that works well. A lot of it is about being predictable as a global organization — what you give focus to and where you do work. Take the example of Verdens Gang, which this spring is in a big migration phase. This is not something that we from product go into VG and say, “Guys, listen. Now you need to migrate.” It’s a joint initiative between the publishers of VG and us. We wouldn’t do it otherwise. Lichterman: So is that one of the shorter-term things you need to do to work toward those longer-term goals? Sundve: For the established products, that’s really key. We also set up a separate unit called Next Gen Products that’s freed up from established processes and products and can do the more radical experimentation. Lichterman: How do those teams work together? Sundve: They complement each other. In terms of innovation, you have the more incremental and the more radical. Otherwise, it would take quite a lot of time before we would be able to innovate systematically toward the end user. Lichterman: In terms of how they complement each other, are there things that you’ve learned for the current platforms that you’re thinking about how to implement on the next-generation? 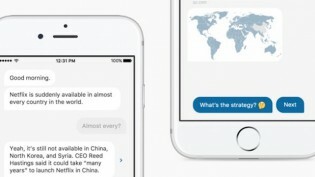 Sundve: One example that we’re exploring now, inspired by Quartz and others, is how can we use a dialogue interface to create a more personal experience. There’s no off-the-shelf plugin for that in a news product. This is really a more radical testing that we’re doing with one of the teams in Next Gen Products. While they figure out how this can be done, it’s being built toward the common platform. If they nail it, all the other companies will be on that other platform and we can scale it out. Lichterman: The chat interface is being done through VG, right? Sundve: We have an experimental new product that we are moving out toward end users that is in closed beta at the moment. Lichterman: Through that process, are there lessons you’ve learned or things that have surprised you as you were developing the system? Have there been any challenges that have come up? Sundve: Absolutely. But it’s been important for that team to be able to pivot and change radically without hurting big revenue streams or massive user engagement levels — to have that separate playground. We’re doing a rather big change now on heavy user research and user feedback. It’s a bigger change in the product, but we’re narrowing it down to specific use cases. That’s one of the more experimental ones. We’re working now on automatic front pages. That’s in the established products, because you need big volume and a significant audience to validate it. We’re doing it at Aftenposten in Norway. Lichterman: So each user gets a different homepage? Sundve: Yeah. So step 1 is making it automatic. Then you can look at the various streams of content that get in. One of the streams is top picks from the newsroom. The other blend you want to do is things that drive conversion, things that are highly clicked, and things that are personalized to you. It’s being proven for Aftenposten. Once we do it there, we’ll take it and scale it to the other companies. Lichterman: How do you account for working in different markets? Are there differences between Norway and Sweden? Sundve: In most cases, what we learn and prove in Sweden, we can take to Norway on a product and tech level. That’s not a major issue. It’s more on the various business models. 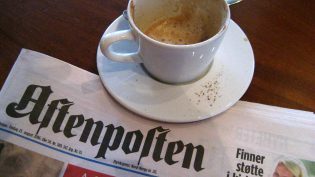 We have Aftonbladet and VG that are reaching 50 to 60 percent of the population on a daily basis going directly to them, while the subscription papers have a different model. We do see differences on whether there’s a priority on things to build for those, but it’s not so much due to the countries. There are more advertising-driven products like Aftonbladet in Sweden and VG in Norway, and then there are more user-payment ones. But none of them are pure subscription or pure advertising, so you still need that blend. Whatever we learn on driving subscription sales, having high retention, and not churning in the subscription papers is also applicable and relevant for the tabloids. Both need a greater understanding of the user journey and the user lifecycle, being able to promote material to get you to subscribe. Both need highly relevant push notifications. Both need engaging and really good placements for native advertising. On a product level, we believe that we can have one core news product serving them all. But there are different types of things you can pick and choose to highlight. The focus given to taking content and converting it into payment, for example, is a bigger topic for the subscription papers than at VG and Aftonbladet, where there is equally as much attention to whether you have high-performing advertising. Lichterman: For product, I guess, you’re just trying to give the editors and the commercial team what they need to be able to make those decisions. Sundve: The tools, the features, the formats, and the placements that they can play with to do those things. Take the example of the curation team that is working with the automated front. They look at editorially important content, things that are driving conversion, things that are highly engaging, things that are personally relevant, native advertising that they can blend in. How you set the value of each of those is up to the publisher and up to your business model, but the capabilities are the same. Take a non-publisher product like Snapchat. They give Discover out and it’s the same playground, but you can act on it very differently depending on who you are. That’s how we think about it. Lichterman: It sounds like the dialogue effort and the automated homepages are still in development? Sundve: Yes, absolutely. But those are two important ones for us. We can unlock new ways of doing it and then give that capability to anyone to play with over a long period of time. Ten or 15 years ago we gave the newsrooms the capability to put articles on the front page. Since then, they’ve innovated on that front page through pixels and placements, through the type of content you put there — when more video came out, you could put video up there — you could put niche content, you could experiment with signing up for morning news briefs. You used that playground for a lot of things and we gave that capacity and freedom to the newsroom. The tricky part now is that we gave those capabilities to the newsroom where they could only innovate on one-size-fits-all. They can only do it manually. They can only do it for a certain type of content, for example. They didn’t have videos natively playing in the feed and so on. We need to change, basically, the fundamentals from the beginning. Lichterman: And 10 or 15 years ago, who would have thought that the chat format could’ve been a way to consume news? Things are changing on that front as well. Sundve: So we’re exploring that. The reason we’re jumping on to that bit is because it’s an established pattern. Media companies typically don’t create the new patterns on any new device. Those are through technology and platforms enabling those. We need to work with them to our best advantage. At the moment, if you want to be relevant or reach people — just while we’re sitting here, this is my lock screen, right? What is the last thing to be turned off there? I suspect that’s the call from your wife or a message that you get. It’s those personal messages. I think that’s why we find it interesting from an editorial perspective: How can we be personally relevant here and not just link to a 1,000-word piece somewhere else? Lichterman: You’ve written about the balance between developing your own platform and working in Facebook Messenger, iMessage, WhatsApp, or wherever all those conversations are already happening. Sundve: It is a balancing act. You definitely want to be on those platforms to try and learn and see what works. But we have a very strong opportunity because we reach so many people directly, and you should think twice before you just give away that editorial freedom and financial freedom. It’s a matter of playing with those areas, testing, and then reusing that piece of technology or rebuilding it to fit your goals. I’m often disturbed by the whole personalization discussion because it tends to be a discussion like “more fashion” or “less sports.” But is it editorially wise to just give that, based on your click history? If you do, in my opinion, you’re solving personalization like a tech platform, not a journalist. We should look at these opportunities, the UX patterns that are emerging, the technology that drives those, and see where we can really innovate to bring out the journalistic aspect. Lichterman: Keeping the reporting and journalism at that heart of the thinking. Sundve: That’s why I’m so motivated by planning with technology here in terms of how we tell the actual stories and how we can personalize on that level: not on what story to tell, but how to tell that story that we’ve chosen. We’ve done quite a bit of research on the younger segment of people who don’t go to a news site first, they go to Snapchat or Facebook first. Norway is surprisingly high up on Snapchat’s radar; that’s where they go to test stuff first. Lichterman: Close to three years ago now, I wrote a story about the public broadcaster in Norway using Snapchat Stories before Discover even existed. Sundve: VG is now running Snapchat Discover in Norway, and it’s really much bigger than they anticipated. It’s blowing their minds. Really big numbers. The key insight that we get from the young audience is that they really have a hard time getting into the news. There’s so many stories, picking which one to get into is hard, so you tend to ignore it, and at some point it’s so complex that you just don’t get into it. Take the election in France, and then there’s an election in Turkey, and there are so many complex stories that you get exposed to that you can’t get into them. There’s so much content being created for each and every one. We are sort of seeing an emerging need to have editorial products that guide you and help you through those stories. This is where I think personalized storytelling could come in and help. When I presented this for the newsroom a couple of years ago — it was here in Copenhagen, next door — I was offline Saturday and Sunday, really offline. It was a weird 24 hours offline. I worked at VG at the time, and Sunday evening I went into VG and there was this massive coverage of a shooting right here. It was the shooting in Copenhagen, the terrorist attack. There was video and tons of things happening. I got a bit of it, but it was just a firehose of information and I didn’t understand the context of. So I felt like I was thrown into level 40 of Angry Birds without being able to get through it. Lichterman: That happens even on a daily basis. I’ll go work out for an hour, and I’ll come back and my phone has blown up and it’s like, what did Trump say this time? Sundve: Exactly, and which one do you pick up and where do you go in? This is where I think we’re at an advantage because we do actually create the content. We can choose how to level out the storytelling, we can adapt our destinations to better fit you. Lichterman: Schibsted is such a large player in these markets and has so much information about readers and such a wide readership in the countries. That must be helpful. Sundve: Absolutely, because we can start doing a lot of this investigation and experimentation on our own. We can start to blend content from multiple publishers and see if that creates value for end users, to see if we can as publishers support each other through data, content, or sending users in ways that we cannot do if we were by ourselves. But I believe that we have to go further. We have a term of Facebook and Google as “frenemies.” But I found it odd when I joined publishing that you think of the other publishers as enemies, not even frenemies. I think we should start exploring how to collaborate around data, around users, and around the actual content to make sure that each and every one of our destinations is really, really good. Lichterman: You mentioned the messaging format and the automated homepage, but what’s next in the development of those products and what else might we see? Sundve: Those are two key components, and the reason that I believe they’re so important is that they empower millions of experiments where you can have an actual feedback loop with the end user. How you use that for advertising, for storytelling, for user payment, is up to each brand. The same is true for automation on the front page. We already have betas out and we have prototypes. We’re launching for the big newsrooms this quarter and next quarter for the automation part. For the more dialogue-driven era, we hope to have something really proven next year. If we do well in both of those areas, we can infuse more advanced AI, remove more of the manual processes and let the journalists do the sophisticated work. We have structured data and systems in place for that structured data so you can start exploring voice, for example, much better than you can in an unstructured content world. I think it’s key to explore emerging technologies that are driven by other companies and then plug them into our product experience. 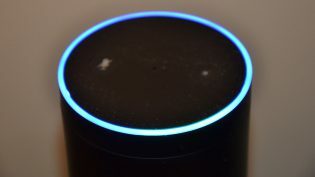 Lichterman: By voice, you mean using Alexa or Google Home? Sundve: Yes, and we see that in one of the key areas where we have highly structured data, which is live sports coverage. It’s not very hard to go from there to natural language generation, which we’re testing out. Which, again, opens up the door very easily for voice. I have a harder time putting VR into that equation, though. Lichterman: Is VR something you’re thinking about also? Sundve: Yeah, but it’s more in the actual newsrooms now. The same with Alexa, which is only in English. You want to test it, but there’s no really way to get anything besides qualitative data back on the performance. In some of these things, we should be really fast adopters of emerging and interesting technology as opposed to just when it starts to get some traction. Lichterman: Is there anything else I should know about? Sundve: This is not a reorganization that is forced upon a publisher. It’s a joint realization that if we join forces we can do more than by operating on our own. That also enables and makes it very easy for us to have integrated work between the newsroom, product, UX, data, and commercial. My key worry when we started investing in a lot of data was that the newsroom [wouldn’t be involved]. They need to be part of it — otherwise, we have no competitive advantage. Lichterman: The data needs to be useful to the newsroom. Sundve: Or, like, what is interesting data to capture? What are the interesting editorial signals to capture. You can’t sit somewhere in a different building and think of those; if you do you’ll just think of the data Facebook captures, which is users, likes, and traffic. Lichterman: What data points are you more interested in capturing? Sundve: At the moment, we do very basic things. In the creation process, it’s getting the meta information around the story itself: tagging, what an image is conveying, what place, what’s the news value of the story, what’s the lifetime of the story. My dream here — and this is far from reality — but take VG as an example. Every day at 10:45, the editor-in-chief goes down to the newsroom. The whole team, not just the newsroom, the whole organization, gathers for 15 minutes of “we’re great at this,” “we’re bad at this,” and these types of things. Those are amazing signals, right? The guy stands there and says: “We don’t portray women like this, this isn’t who we are.” There are a lot of these editorial aspects that we could start to capture. Lichterman: So more qualitative things that you’re then able to quantify? 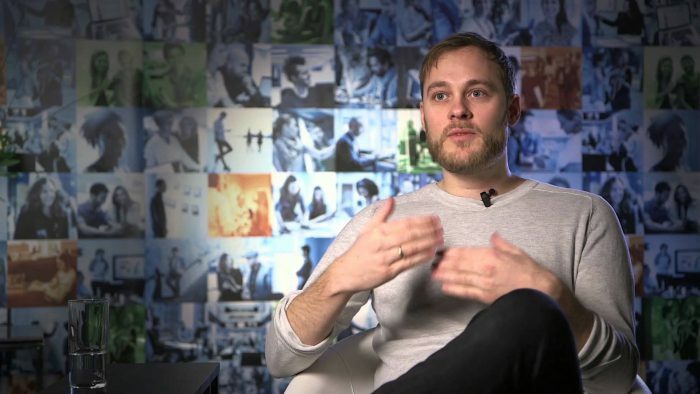 Sundve: I want to make sure over time that we’re able to quantify a lot of those things, so that when we do automation and personalization, we infuse the editorial signals in a very sophisticated way. Screenshot of Sundve from this YouTube video. POSTED May 3, 2017, 11:35 a.m.
Lichterman, Joseph. "Schibsted is creating new editorial formats — from messaging to personalized homepages." Nieman Journalism Lab. Nieman Foundation for Journalism at Harvard, 3 May. 2017. Web. 19 Apr. 2019. Lichterman, Joseph. "Schibsted is creating new editorial formats — from messaging to personalized homepages." Nieman Journalism Lab. Last modified May 3, 2017. Accessed April 19, 2019. https://www.niemanlab.org/2017/05/schibsted-is-creating-new-editorial-formats-from-messaging-to-personalized-homepages/.